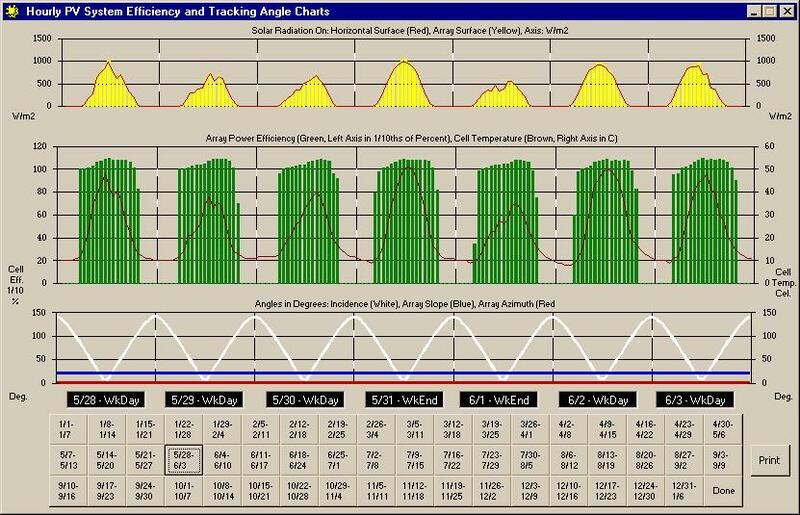 16AUG10: Auburn University’s Solar Photovoltaic Array Tilt Angle and Tracking Performance Experiment verifies the accuracy of PV-DesignPro. Presentation. Paper2. Presentation. 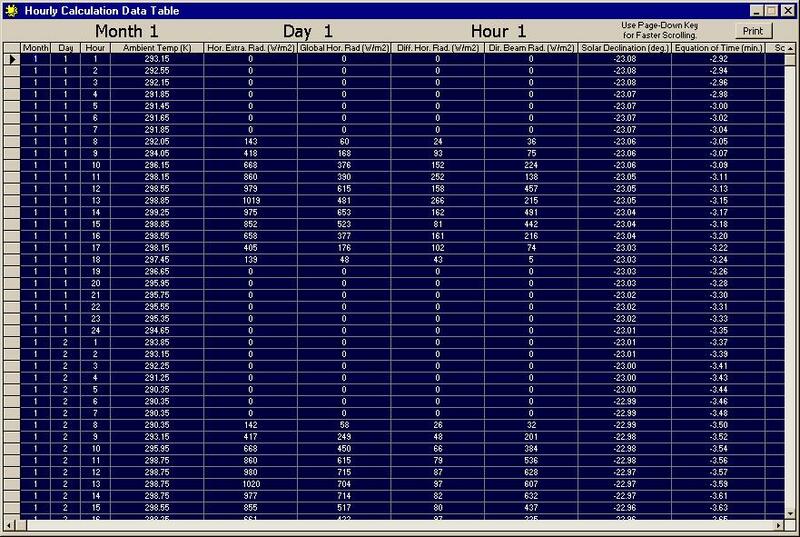 UPDATE 05JUL09: TMY3 Climate Data (104MB) formatted for use with PV-DesignPro (1,020 U.S. locations). 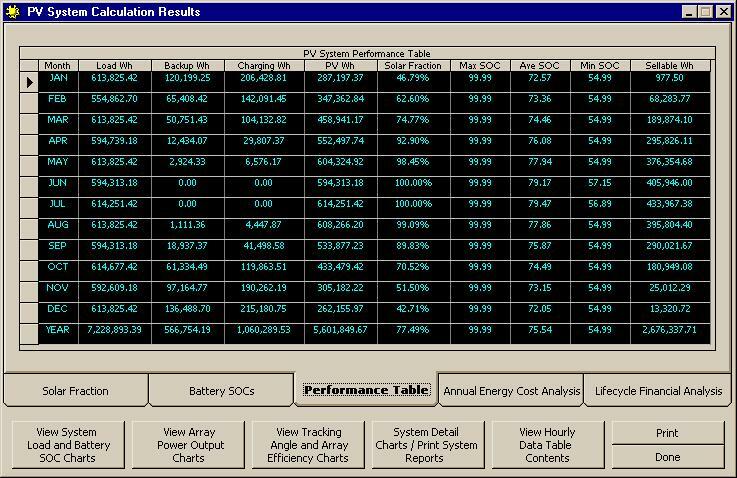 UPDATE 07JUL09: PV Module Database. Now with 445 late model modules. 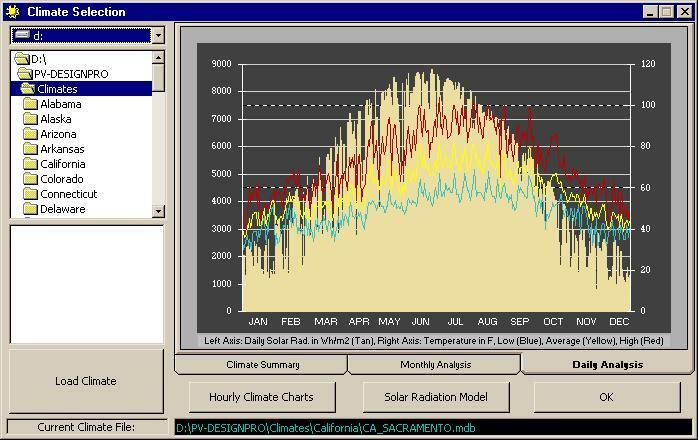 PV-DesignPro owners may download the entire 1991-2005 NSRDB Dataset (2.0GB) formatted for use with PV-DesignPro (1,454 U.S. locations / 21,810 climate years). "Besides being a very good design tool for the professional, DesignPro is also a great learning tool. 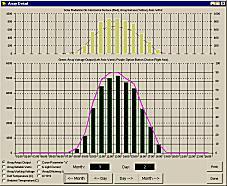 "What-if" scenarios can be set up and quickly run, providing invaluable lessons." 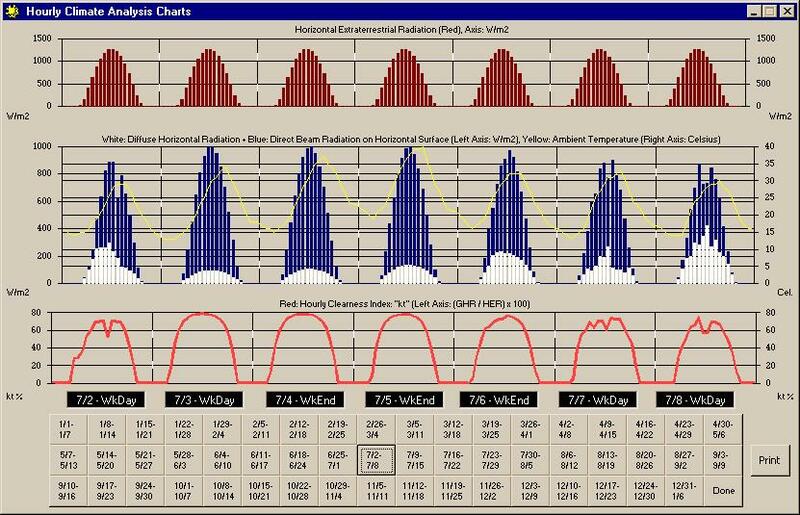 "The IV Curve Tracer [included on CD] represents the latest modeling of PV performance based on extensive field testing at Sandia Labs by David King and his colleagues. 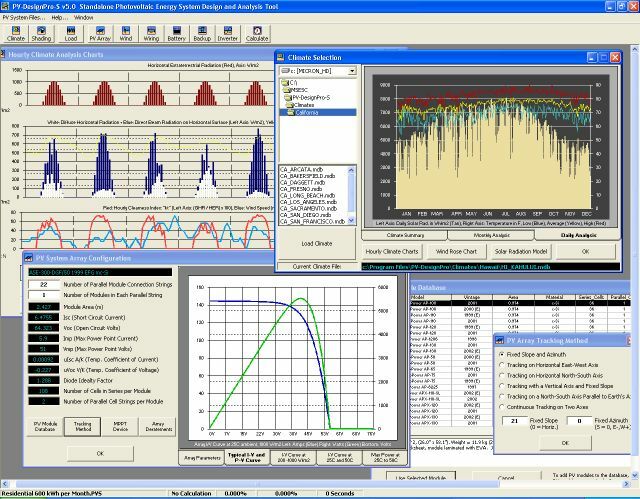 PV-DesignPro uses the Sandia model as the heart of the design algorithm. 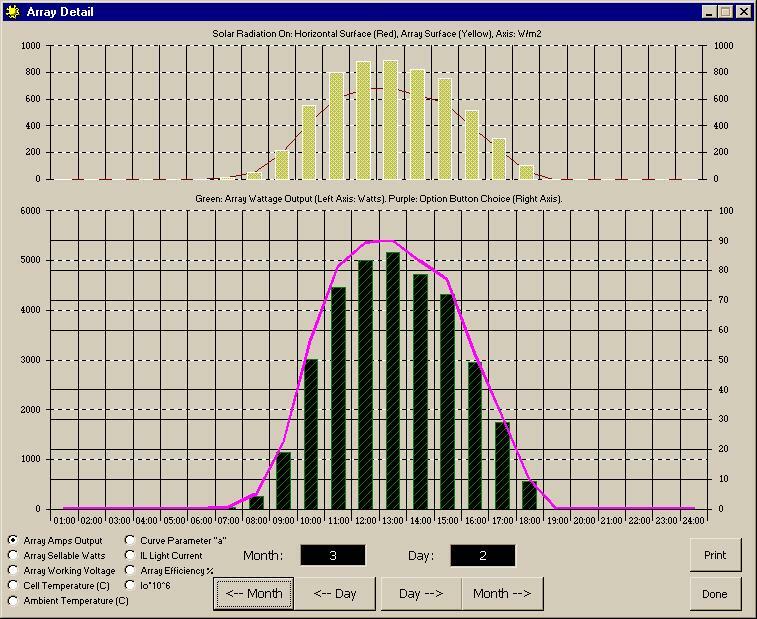 The Sandia model not only incorporates the latest mathematics, but also includes significant adjustments based on empirical values derived from field testing." "Particularly useful and an absolute A+ on your part is the inclusion of costing and buyback factors that show a true financial profile for a given system." 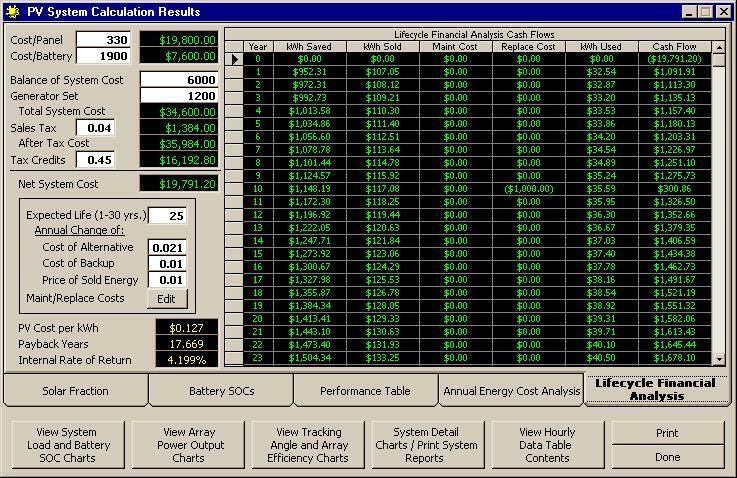 "Without a doubt, Hawaii, US-based Maui Solar Energy Software Corporation (MSESC) offers the software with the best price-performance payoff. 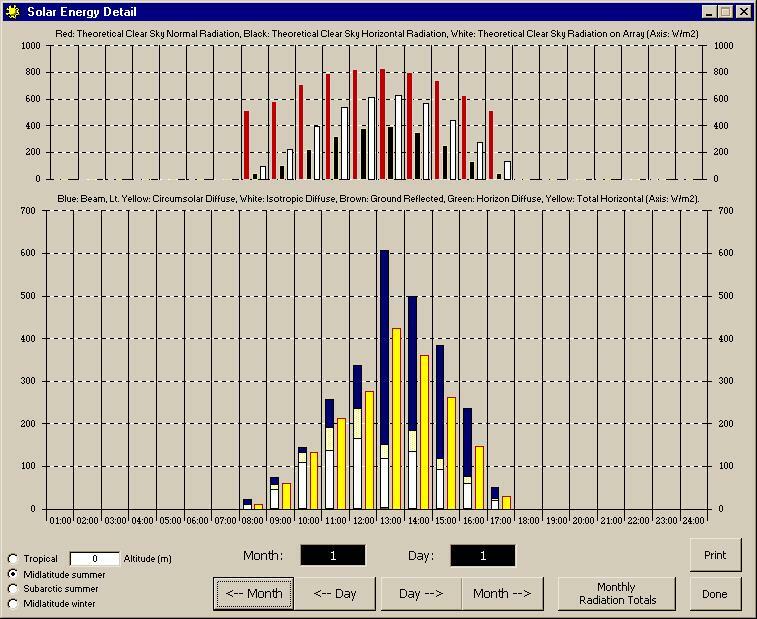 PV-DesignPro can be used to calculate on-grid, off-grid, and PV pumping systems." 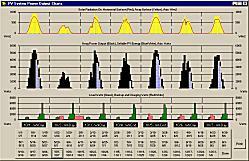 PV-DesignPro v6.0 is a suite of Windows 95, 98, NT, Win2000, and Vista compatible software designed to simulate photovoltaic energy system operation on an hourly basis for one year, based on a user selected climate and system design. 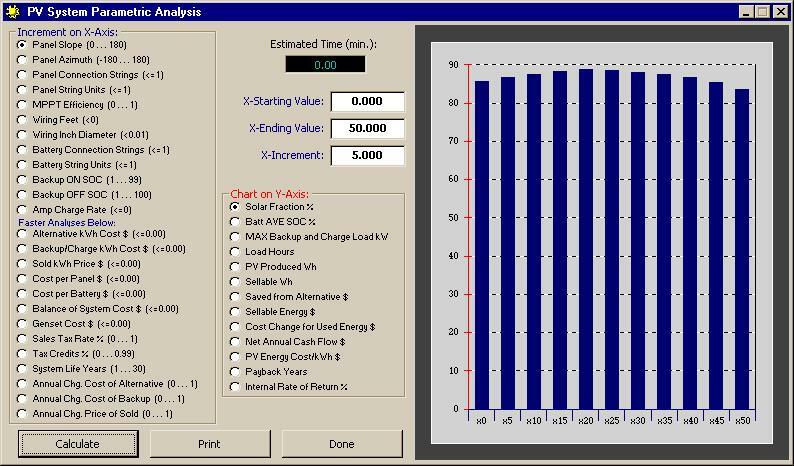 Three versions of the PV-DesignPro program are included on the Solar Design Studio CD-ROM: "PV-DesignPro-S" for standalone systems with battery storage, "PV-DesignPro-G" for grid-connected systems with no battery storage, and "PV-DesignPro-P" for water pumping systems. 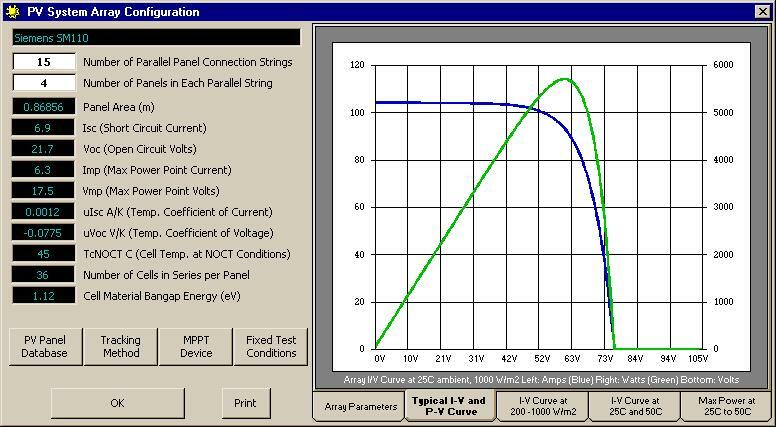 Below is a screen-shot of the "S" version of PV-DesignPro. 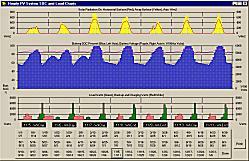 The purpose of the programs are to aid in photovoltaic system design by providing accurate and in-depth information on likely system power output and load consumption, necessary backup power during the operation of the system, and the financial impacts of installing the proposed system. 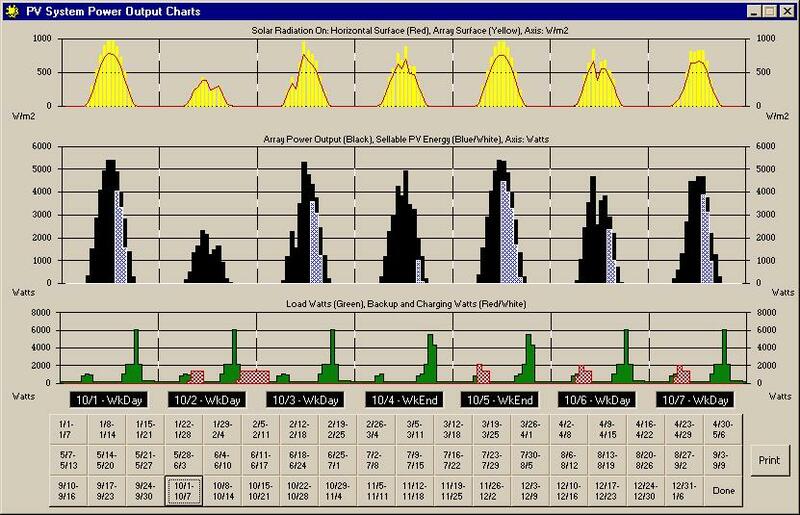 PV-DesignPro is directed at individuals who consider themselves as professional PV system designers and researchers, but has been completed in such a way as to make it possible novice designers to evaluate system designs. 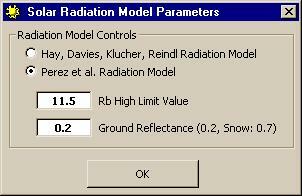 Users can select climates simply by browsing the various files in the climate window (as shown in the link below). 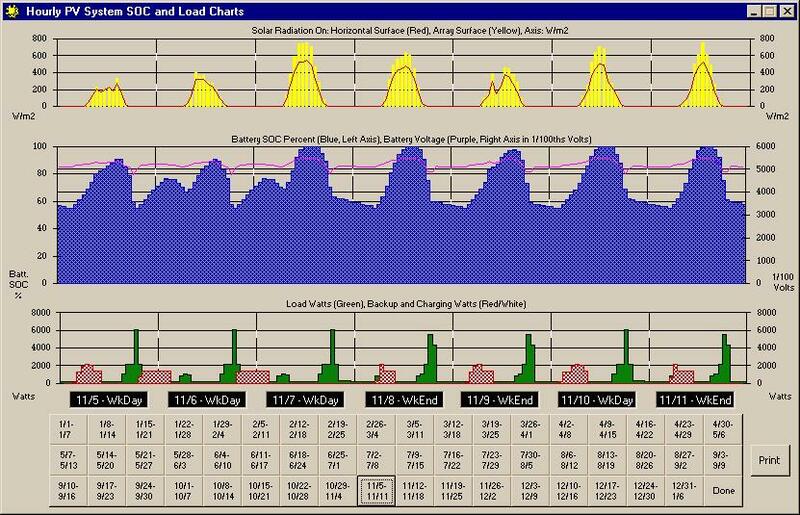 The electrical load on the system is input by the user for various hours of weekdays, weekends, and holidays. 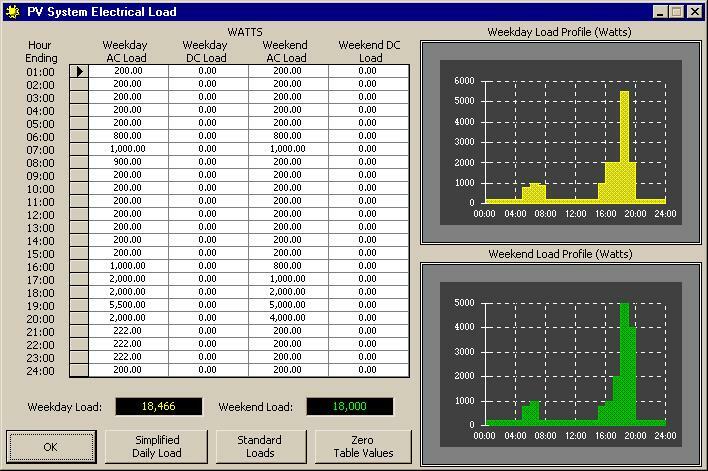 The hourly loads remain the same for respective weekdays and weekends throughout the annual simulation (as shown in link below). 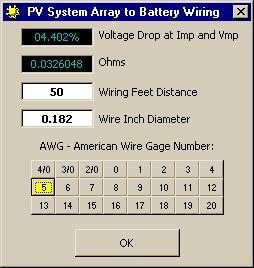 The PV system array is modeled using various published equations and manufacturer provided panel parameters. 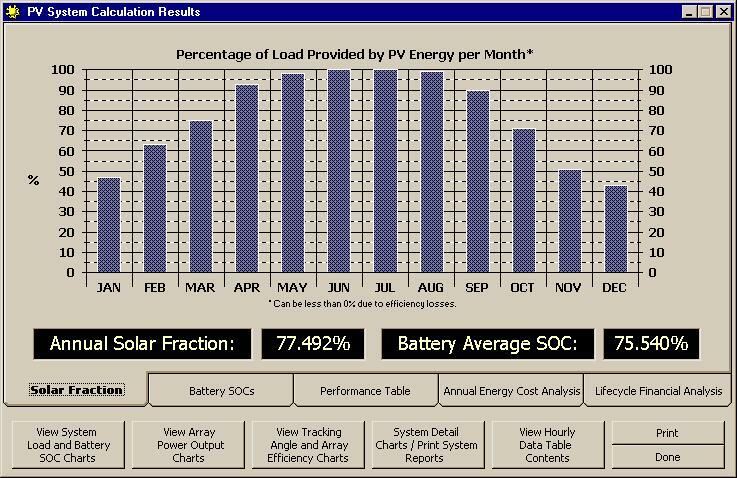 The user need only select the type of panel from the database of PV panels, and input the number of parallel connections and series strings of similar panels. 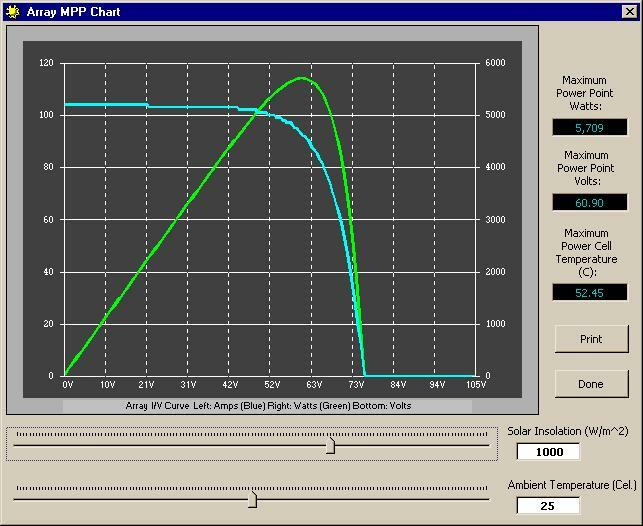 Various chart outputs, such as the typical I-V-P curve shown on the array window link below, are available to the designer to estimate performance. 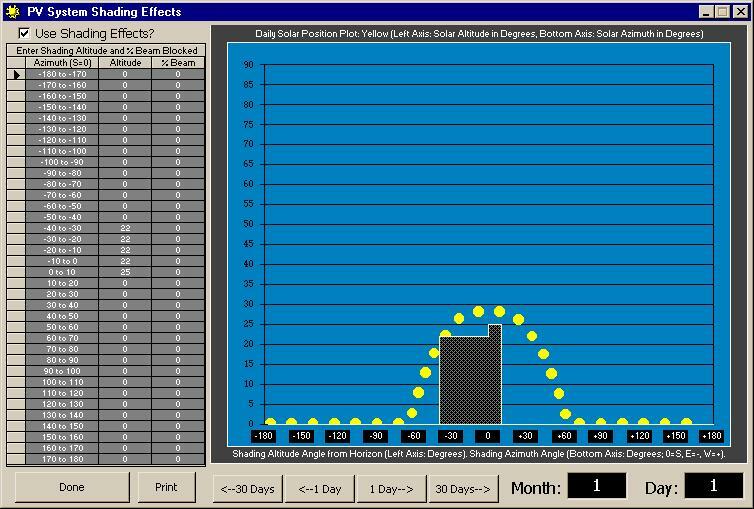 Six types of panel surface tracking are incorporated into the program and are available to the user: 1. 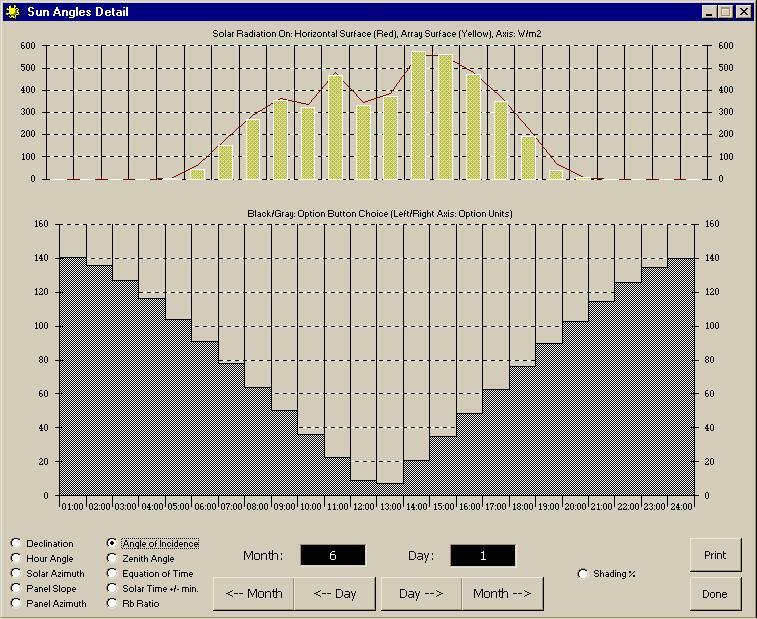 Fixed slope and axis, 2. Tracking on a horizontal east-west axis, 3. Tracking on a horizontal north-south axis, 4. Tracking on a vertical axis with a fixed slope, 5. 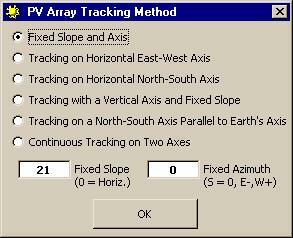 Tracking on a north-south axis parallel to the Earths axis, and 6. 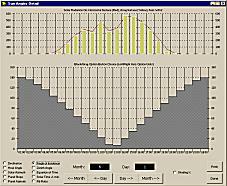 Continuous tracking on two axes. As a result, the benefits of utilizing any of the available tracking methods are easily attained. 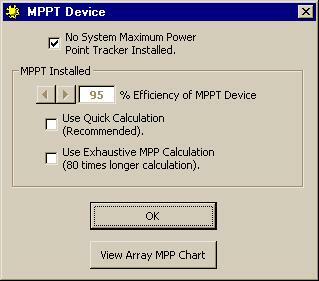 Maximum power point tracking devices can be entered into the design, however, their overall efficiency must be known. 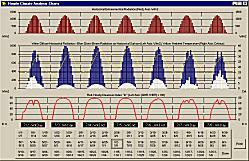 Also, wiring diameter and distance to and from the panels to the battery are accounted for in the design with relative voltage drop and power loss. 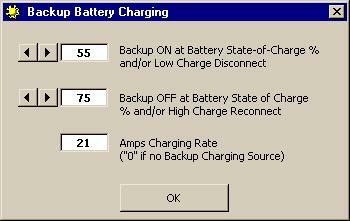 Battery backup charging parameters are selected by the user, as are any AC inverter necessary to power AC loads (a database of various inverters is included with the program). 2. 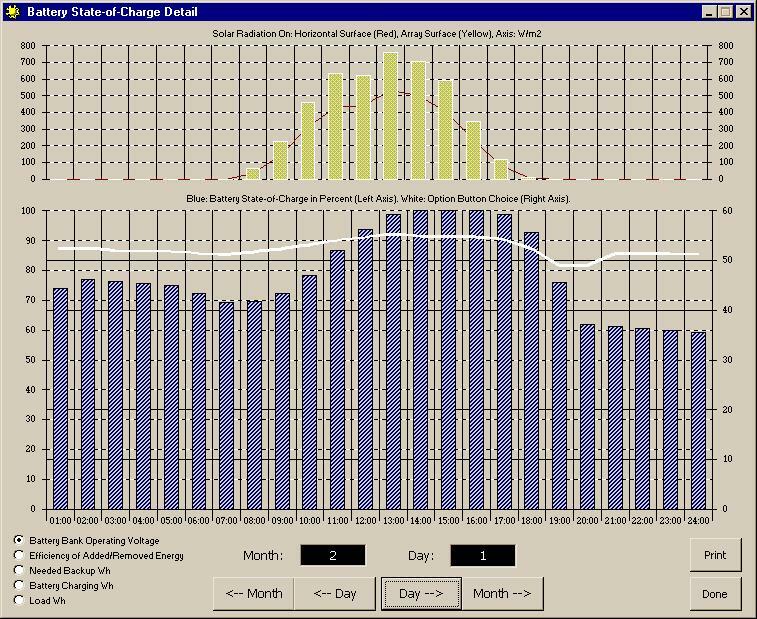 Battery states of charge by month (maximum, average, minimum). 3. 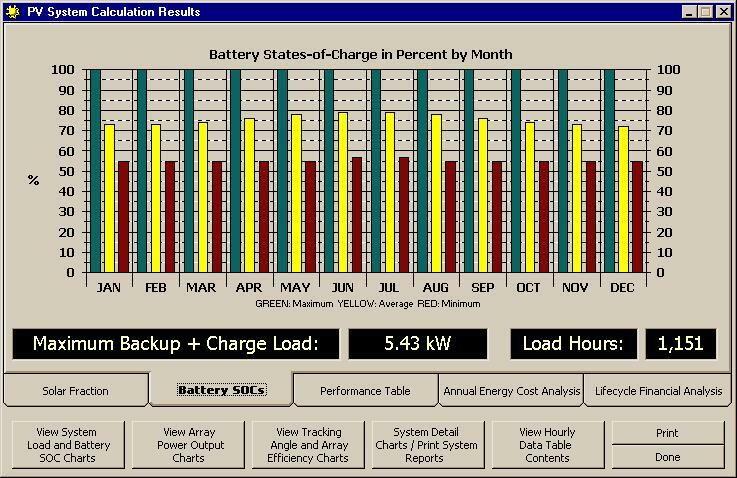 Annual performance table (energy produced, necessary backup, and states-of-charge). 4. 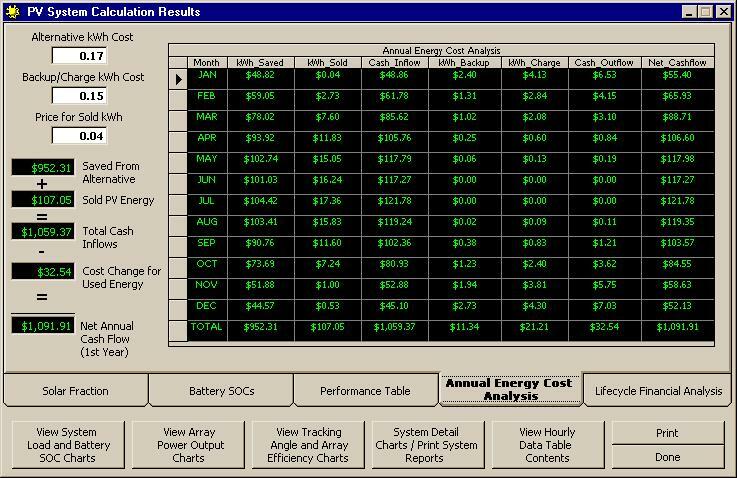 An Annual Energy Cost Analysis that includes prospective cash-flows based on costs of purchased energy, and any sold PV energy. 5. 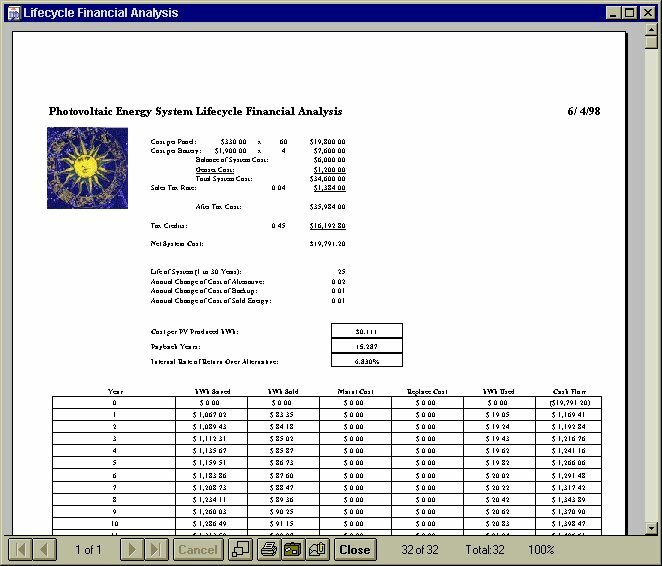 A Lifecycle Cost Analysis that is a comprehensive pro-forma analysis of the system design based on system cost, costs of backup energy, prices of sold energy, maintenance and replacement costs, and the estimated life of the system. 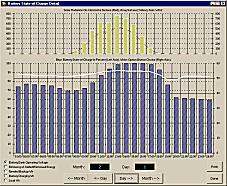 A rate of return is calculated, as is an overall price per kWh of the system, and pay back years. 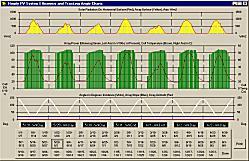 Charts can be viewed that cover every hour of the year and include battery SOC, battery voltage, solar radiation on a horizontal surface, solar radiation on the array, load and backup watts, panels efficiency, panel cell temperature, angles of incidence, slope angle, and the azimuth angle. 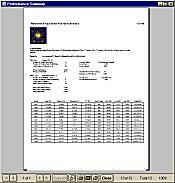 Full system reports can be printed that include most of the information contained in the above results. 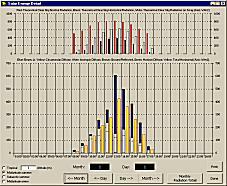 Once the user has completed a design, it can be saved as a file and reused or modified at a later date. 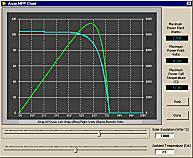 How hard is it to learn to use PV-DesignPro? Read the "Quick Start" help file text here.